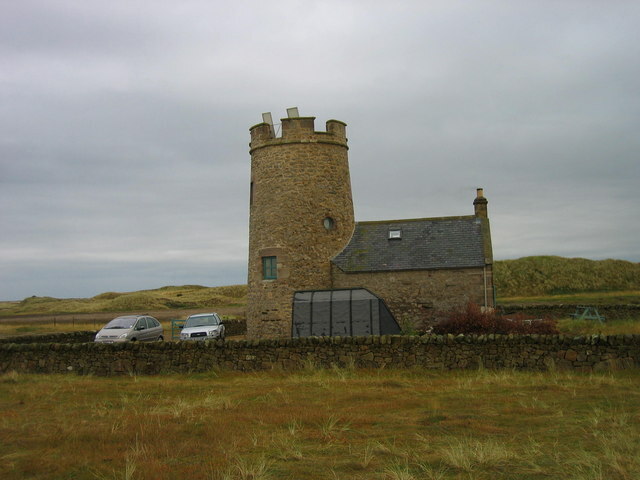 A little off the main drag linking Holy Island to the mainland are a pair of curious erections known as Snook House and Snook Tower. 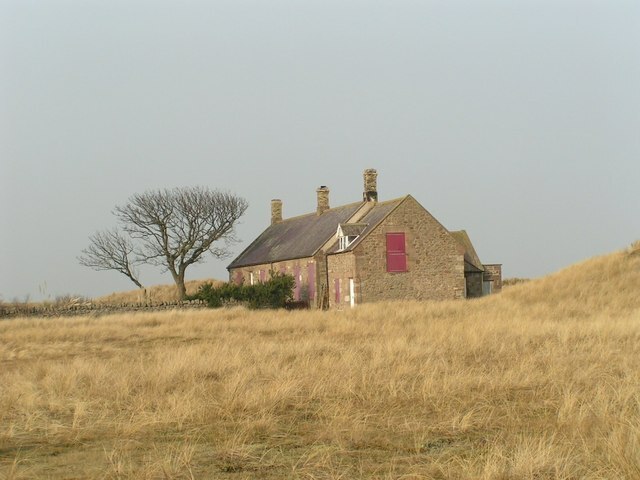 Located on the sticky-out bit on the landward side of the island known as, in fact, ‘The Snook’, these isolated buildings are universally ignored by those intent on making the most of their window of sea-less opportunity who strike on regardless along the Causeway to Holy Island village, some 2 miles eastward. There isn’t a great deal to say about them, as not a lot is known – at least by me. Any input would be most welcome. The first, Snook House, looks for all intents and purposes like any other domestic dwelling – which I’m pretty sure it is. However, it was once a ventilation shaft for Scremerston Colliery some 7 miles NW and very much on the mainland. From Scremerston the coal seam dips down deep below Holy Island and out to sea. The old colliery closed in 1965. … and nearby Snook Tower. Of Snook Tower, however, little is conveniently known. Build, presumably, in the nineteenth century, its purpose seems to have been nothing more than that of an observation tower or look-out point. This is only a problem at low tide, of course, but it is worth bearing in mind when your dog starts digging around thereabouts; and is especially relevant should your walking stick alight on something metallic as you pick your way through the marram grass in an otherwise carefree manner. For Goswick Sands can be a volatile stretch of coastline. During World War II, when rookie bombing crews needed a bit of practice before the real thing, the RAF sent many of them to this remote corner of the country to hone their skills. Countless explosive devices were dropped, including a good many that somewhat inconveniently decided to bury themselves in the sand and remain undetonated. 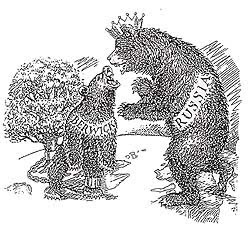 This was the least of our worries back in the early 1940s, of course, but it has caused some concern since. Since 1945, the RAF has periodically returned to the site to effect a bit of clearance work, and since 1995 has maintained a permanent presence there. In 2005, two 500lb bombs were exposed during a storm, and the resultant controlled detonation could be heard in Berwick, some ten miles distant. Then, in 2009, a total of seven devices were disposed of in similarly spectacular fashion in front of crowds of excited spectators. The government is currently considering pulling the plug on the full-time bomb disposal team as financial cuts take precedence over the public’s safety. 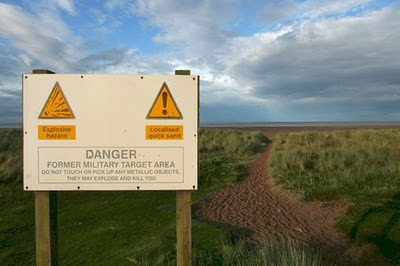 Experts assure us, however, that it is virtually impossible to blow yourselves to smithereens at Goswick, unless you are minded to venture out onto the sands with a JCB. The signs, however, paint a more worrying picture. Many who visit the caravan park at Haggerston are somewhat disappointed at the paltry remains of the old castle. A tower and rotunda are all that survive of the edifice today – both Grade II listed buildings, but somewhat swamped and degraded by their current predicament. The structure’s original inhabitants, the de Hagardstons, supposedly came over with the Conqueror. A castle is known to have existed at least as far back as 1311, but a succession of fires have blighted its history leaving historians bereft of much in the way of paperwork on which to base their work. It is speculated, however, that there was a stronghold of sorts occupying the site from the late 1100s. In subsequent centuries the old place passed down and through a succession of landed families – you know, the usual story – but the original name stuck, which is more than can be said for the castle walls themselves. The 1880s saw the Haggerston estate pass into the hands of one Christopher John Naylor; and when the said individual later inherited his uncle’s fortune he switched his name to C.J.Leyland and moved from his Powys home up to Haggerston. From 1893, Leyland set to work revamping the castle/house and gardens, which included the planting of six new hybrid trees called Cupressocyparis Leylandii, which had been recently developed on a small scale by his brother back in Wales. Another fire (in 1911), and Leyland’s death (in 1926) hastened the almost complete demolition of the castle – and its sale – by the mid-'30s. However, Haggerston’s great legacy became a horticultural one. In 1925, a firm of commercial nurserymen rediscovered the old leylandii, recognised their potential, and began marketing them as Haggerston Grey leylandii. Other nurseries – as well as the Forestry Commission – jumped on the bandwagon, enthused by the tree’s fast-growing properties. Many other hybrids have since been developed, and it was for many years the biggest selling item in every garden centre in the UK. So if you’ve an issue with your neighbour’s rampant hedge, blame Northumberland’s Haggertson Castle, and its overzealous former owners. Ancroft, a rather desolate-looking affair, sits on high ground above the Dean Burn, 5 miles due south of Berwick. There is not much to see there, but the hamlet harbours a horrid secret in a nearby field formerly known as the Broomie Huts. In 1667, when plague struck the nation, the villagers of little Ancroft thought it best to isolate the victims of the horrible disease in the aforementioned field. There they made shelters for them from sticks of broom (a type of shrub), and left them to die. Afterwards both bodies and huts were burned in an attempt to eradicate the disease – the field in question being, allegedly, the one standing opposite St.Anne’s Church. As a further measure, the old cottages which had been affected by the visitation were burned also, with the village effectively moving a little to the east to its present location. The site of the old settlement can still be discerned in a field of undulating appearance – and the famous line of trees nearby supposedly represent the families that suffered during this horrible episode. Shoresdean, an unremarkable housing estate some 5miles SW of Berwick, bears a history of little antiquity. A somewhat isolated spot for a coal mine, this little settlement nevertheless had one from the 19th century; and the cluster of houses which stand a little to the north of the old mine works are no more than a few decades old. 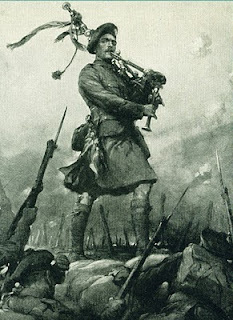 However, the hamlet is famous as being the place where the famous ‘Piper of Loos’ passed away. Daniel Laidlaw was born at Little Swinton, Berwickshire, in 1875. Joining the Army in 1896, he found himself in the 7th Battalion of The King’s Own Scottish Borderers on the outbreak of World War I. He and his comrades arrived in France in 1915 and by September were in the front line near Loos. On the morning of the 25th they were preparing for their first foray ‘over the top’. At 6.30am, and under heavy German artillery fire as well as clouds of swirling gas (fired by the British but blowing confusedly back over their own lines), Laidlaw and his colleagues launched into battle. With chaos reigning, the commanding officer ordered Piper Laidlaw to “pipe them together”, which our man duly did by climbing into full view of the enemy and charging his pipes. To the tune of Blue Bonnets O’er the Border, the 7th Battalion rallied and rushed toward the German trenches. Laidlaw continued playing with complete disregard for his own safety until, falling, wounded, just short of the enemy line as his fellow soldiers won the day. For his “conspicuous bravery” Laidlaw was recommended for, and awarded, the Victoria Cross – as well as the French ‘Croix de Guerre’, whose troops had been similarly inspired in neighbouring trenches by his actions. Our hero survived the War, lived a full life, and eventually died at Shoresdean in June 1950, aged 74. Hundreds of mourners from all over the country attended his funeral. He lies buried in Norham churchyard, where a headstone was placed over his grave in 2002. It may be Berwick’s poor relation when it comes to recent historical attention, but it’s just possible that Tweedmouth, on the southern bank of the river from which it gained its name, may have been the place to be in this part of the world in the days of the Romans. Berwick itself has no evidence of pre-(Norman)Conquest occupation, though its place-name suggests that it may give up some such evidence someday. Tweedmouth, however, is much better placed for any potential Roman super-discovery. The Devil’s Causeway, the Roman Road which stretches northward from its junction with Dere Street near Corbridge for 50+ miles, points directly at the town – though falls tantalisingly short a mile or so to the south in the fields near Springhill. At one time Springhill was thought to be the site of a Roman Fort, such are the features of its landscape – but this is not now thought to be the case. Since this area to the south of the Tweed has barely been scratched by archaeologists, then circumstantial evidence and speculation is all we have to go on – though common sense strongly suggests that a Roman site on or very near to Tweedmouth, at the very top of the Causeway, is likely to have existed when the great thoroughfare was in use. There is enough solid evidence at other sites in the area to the south of the Tweed to suggest that Roman activity was substantial hereabouts. And the presence of a port, fort or supply base at the mouth of the Tweed – with the river acting as both a line of supply and a natural line of defence to the north – would tie in with everything we know about the Romans from other parts of their empire. Additionally, Tweedmouth has for centuries provided Berwick with its deep water dock, which would suggest that this may have had a historical precedent with the Romans. Just look at a map. It all makes sense. ‘Bout time someone started digging. It’s a beauty, isn’t it? And a big ’un, to boot. It’s Berwick-upon-Tweed’s magnificent Royal Border Bridge, of course – the undoubted star of the East Coast London-Edinburgh rail line. Begun in 1847, it was the very last section of the famous old route to be completed, being opened by Queen Victoria herself, no less, some three years later on 29th August 1850. Though the celebrated railway engineer, Robert Stephenson, claimed the glory for its design, he was little more than a figurehead in reality. Assistant engineer, Thomas Harrison, and resident engineer, George Barclay-Bruce, did most of the donkey-work – with contractors McKay and Blackstock responsible for pulling off the building feat itself to such aesthetic perfection. And the construction process must have been a tricky one. The bridge was completed later than the rail line itself, the stone viaduct being built around and from within a temporary wooden affair. 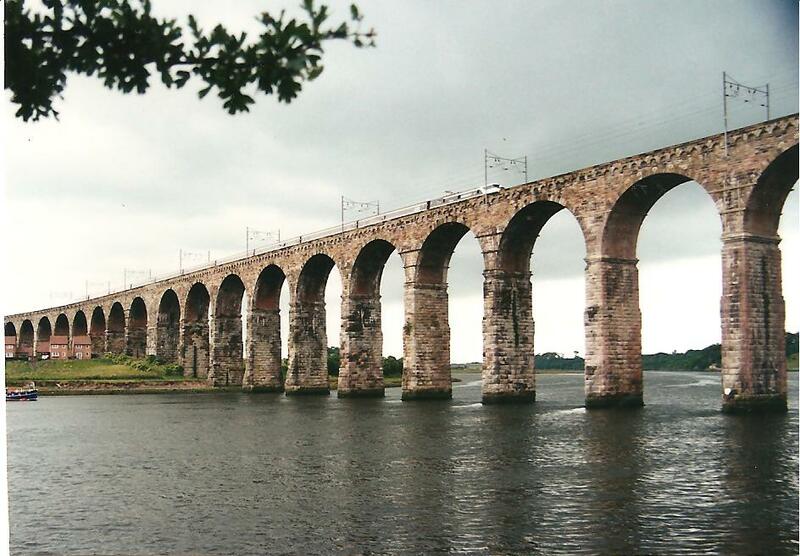 The foundations were driven down through some 12m of gravel to the bedrock using a state-of-the-art Nasmyth steam-powered pile-driver; and the stone piers – framing 28 giant arches – pushed the viaduct up to a dizzy 38m above the River Tweed. The bridge stretches a lengthy 658m (just over 0.4mile), and was later modified, width-wise, to accommodate an extra rail track. It is now a Grade I listed building. No such protection was offered to old Berwick Castle, however, during those thrusting Victorian days. For the already ruinous landmark was pretty much obliterated during clearance work for the bridgehead and station, masonry being thoughtlessly and enthusiastically recycled during the bridge’s construction. It is thought that the very spot where King Edward I took oaths of allegiance from the Scots in 1296 lies beneath the present-day station platforms. In the narrow gap between Berwick-upon-Tweed and the Scottish border lies the site of the Battle of Halidon Hill. Fought between the armies of England and Scotland on 19th July 1333, it was the first battle of the so-called Second War of Scottish Independence. After the Treaty of Northampton had brought the first series of conflicts to a shaky end in 1328, Scottish-held Berwick soon found itself under siege by the English in the spring of 1333 as diplomatic relations deteriorated once again. Ensuing negotiations betwixt the two nations left Berwick as the agreed prize in a straight fight between the respective circling armies of England’s King Edward III and the Scots under Sir Archibald Douglas, the ‘Guardian of the Realm’. The English ensconced themselves upon Halidon Hill, a modest 530ft prominence two miles north-west of Berwick, and awaited the approach of the enemy. The Scots advanced on the English position from Duns to the north-west, across a muddy hollow; here they were caught in fierce archer crossfire from both flanks, and left with little choice but to plough slowly onward and upward towards the bristling English ranks. Though they reached the English line, the Scots were soon scrambling around for cover – and many fled for their lives in retreat, with the English cavalry in bloody pursuit. Though the Highlander division fought to the death, the Scottish defeat was complete, with several thousand casualties. King Edward, on the other hand, lost no more than few dozen men – and Berwick reverted back into English hands. The Battle of Halidon Hill was seen as English revenge for Bannockburn in 1314. Edward III, though, failed to drive his advantage home in the years thereafter, and the Wars raged on for several decades more. View from the site of the Battle of Halidon Hill, looking south(-ish). 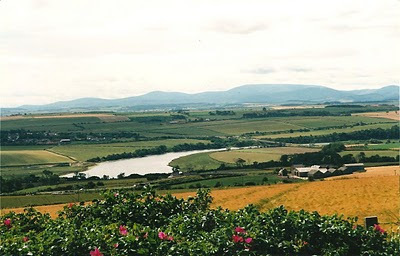 The River Tweed and the Cheviot Hills make it into the frame.